collectSPACE - news - "Astronaut Hall of Fame to honor two space commanders and a satellite repairman"
January 21, 2009 — The first American to command five space missions, the first commander of the International Space Station (ISS) and a member of the first repair team to service a satellite on-orbit will be enshrined this May in the U.S. Astronaut Hall of Fame. James Wetherbee, William Shepherd and George "Pinky" Nelson were confirmed on Wednesday by the Astronaut Scholarship Foundation as comprising the eighth group of space shuttle astronauts to be named to the Hall. A gala and an induction ceremony will be hosted at the Kennedy Space Center Visitor Complex in Florida, home to the Hall of Fame, on May 1-2, 2009. In between flying six times to space -- five times as the mission commander -- James D. "Jim" Wetherbee played drums with the all-astronaut band, Max Q. Making his first flight in 1990, piloting the STS-32 mission that returned from orbit the school bus-size Long Duration Exposure Facility (LDEF), Wetherbee's first command was two years later launching an Italian laser geodynamic satellite on STS-52. Wetherbee's four remaining shuttle flights, stretching from 1995 to 2002, were spent visiting and assembling space stations. He flew twice to Russia's Mir, commanding the first shuttle mission to rendezvous with the outpost, and the longest flight to stay docked (STS-63 in 1995 and two years later, STS-86). He then flew two times to the International Space Station, conducting the first crew exchange and then returning to install part of the station's backbone truss. STS-102 lifted off in 2001 and STS-113 in 2002, the latter being the last successful shuttle mission before the loss of Columbia in February 2003. 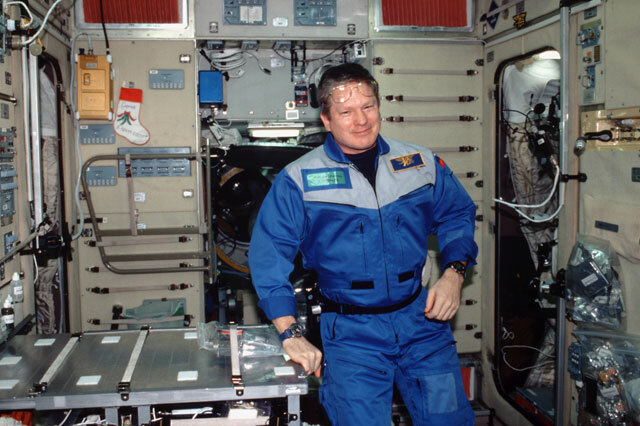 Wetherbee retired from NASA in 2005 after logging more than 65 days in space and serving as deputy director and director of flight crew operations for the Johnson Space Center. Today, Wetherbee works as a safety auditor with BP. In addition to his other records, Wetherbee was the tallest astronaut to fly to space at 6 feet, 4 inches. 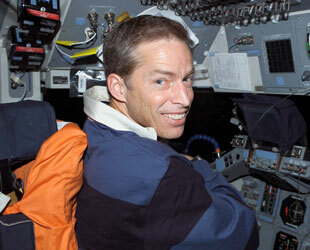 William M. "Bill" Shepherd's fourth and final space flight ended with Jim Wetherbee in command. Shepherd flew home after commanding the International Space Station's first expedition, returning with Wetherbee's fifth mission. 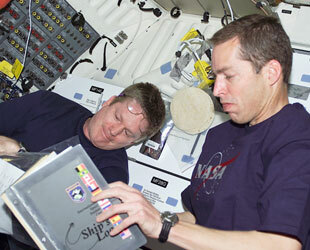 Five months earlier, Expedition One began with Shepherd giving the ISS its unofficial call sign, "Alpha". A former Navy SEAL, Shepherd first flew 13 years before as a mission specialist on STS-27, a classified mission for the Department of Defense. He also flew with STS-41, launching the Ulysses probe to explore the polar regions of the Sun, and aboard STS-52, another mission that he shared with Wetherbee. 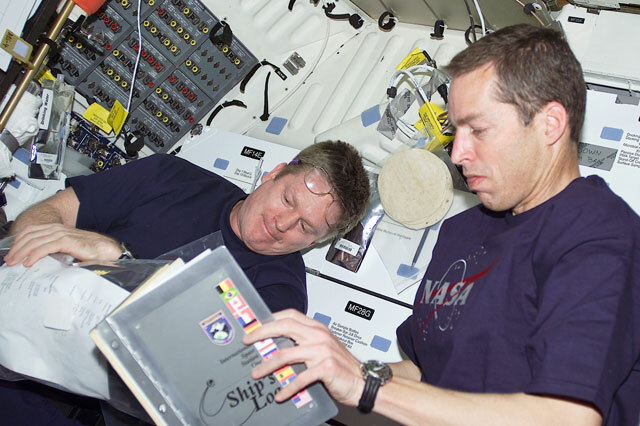 Shepherd also served as Program Manager and Deputy Program Manager for the ISS program from 1993 to 1996, and helped craft the U.S. government's framework for a joint space station program with the Russians. A recipient of the Congressional Space Medal of Honor, Shepherd left the space agency in 2002 and went on to become a civilian engineer assigned to the staff of the Commander, Naval Special Warfare Command, to assist with the development of programs for the SEALs and Special Boat Sailors of Tomorrow. 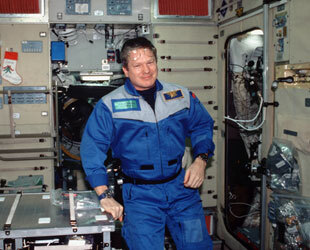 While living on-board the space station, Shepherd filmed his experiences, which became part of the award-winning IMAX 3-D movie, "Space Station". George D. "Pinky" Nelson, who sang and played guitar in the same all-astronaut band as Wetherbee, also starred in an IMAX film like Shepherd, capturing his work as one of the first spacewalkers to repair a satellite. 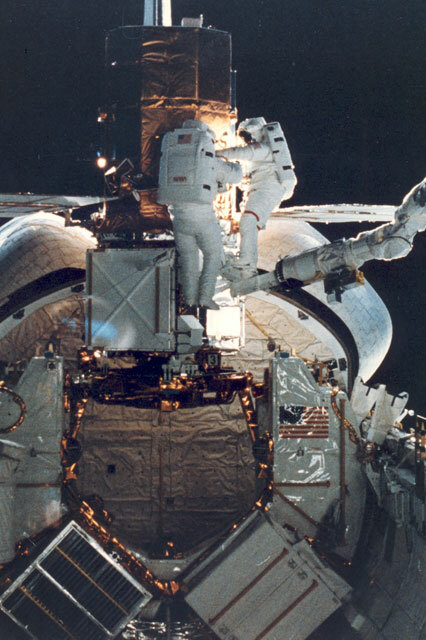 As a mission specialist on STS-41C, Nelson, together with James "Ox" van Hoften, repaired the malfunctioning Solar Maximum Satellite during two spacewalks, which were later featured in the IMAX large screen film, "The Dream is Alive." 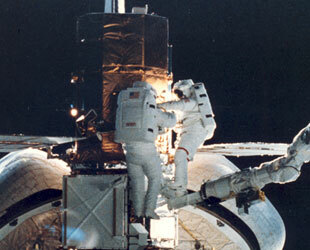 The mission, which flew in April 1984, deployed the same Long Duration Exposure Facility that Wetherbee recovered six years later. Nelson launched to orbit twice more, on the spaceflights immediately preceding and following the loss of shuttle Challenger. He served as a mission specialist on-board STS-61C in January 1986, which launched the satellite SATCOM Ku-1, and STS-26, the first "return to flight" for the space shuttle fleet following the Challenger accident. During his 11 year career as a NASA astronaut, Nelson was also the first and only American to test "fly" Russia's version of an astronaut's jetpack, a manned maneuvering unit. Holding a doctorate in astronomy, Nelson became involved with the Hubble Space Telescope after leaving the astronaut corps, joining NASA's Space Telescope Repair Mission Task Force. In 1995, he began serving on the Hubble's servicing mission external readiness review team, which he went on to chair from 1998 through 2003. Nelson today is the Director of Science, Mathematics and Technology Education at Western Washington University. 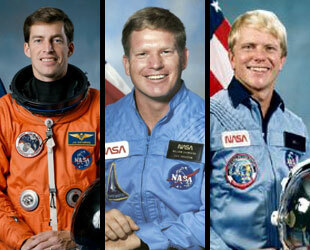 The addition of the three men will bring the Hall's number of enshrined space explorers to 73, which includes all of the Mercury, Gemini, Apollo and Skylab astronauts. The 2009 members were selected by a committee of current Hall of Fame inductees, former NASA officials and flight directors, historians and journalists. 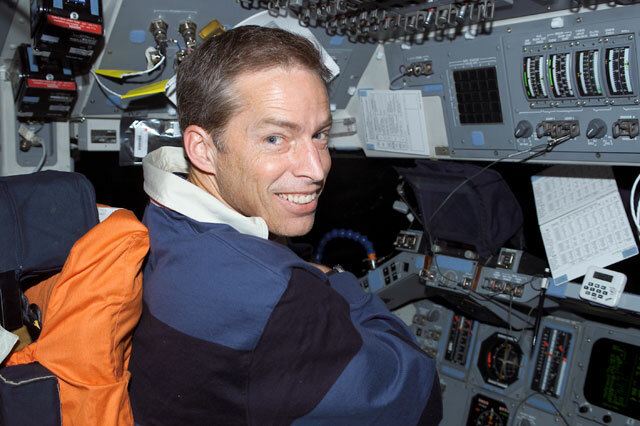 To be eligible, the 2009 astronauts had to have made his or her first flight in 1992 or earlier, and have been retired for at least five years from NASA's corps. The candidates were required to be U.S. citizens, and have been trained by NASA as a commander, pilot or mission specialist. In addition, they had to have completed at least one orbit of the Earth. The public is invited to attend the Hall of Fame induction ceremony at the Kennedy Space Center Visitor Complex on Saturday, May 2, 2009.